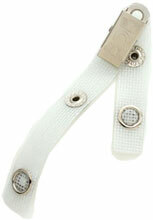 S2204WHT	 2-Hole Smooth-Face Clip, Strap Clip with Two Straps. Sold in quantities of 100. Priced per 100 units. The Brady S2204WHT is also known as Brady People ID	S2204WHT	.